Astroscale, the space debris removal startup, has contracted with Glavkosmos/GK Launch Services to launch its pioneering ELSA-d (End of Life Services by Astroscale -demonstration) mission on a Soyuz-2 cluster mission from Baikonur Cosmodrome in early 2020, according to press releases from both companies. 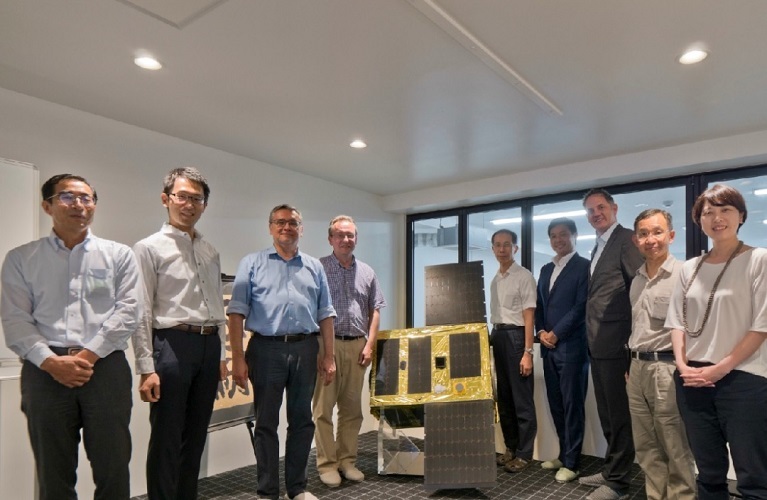 ELSA-d, which stands for End of Life Services by Astroscale (-demonstration), is an in-orbit demonstration of the rendezvous and docking technology for future semi-cooperative debris removal missions. ELSA-d consists of two spacecraft, a Chaser (160 kg) and a Target (20 kg), launched stacked together. The Chaser is equipped with proximity rendezvous technologies and a magnetic capture mechanism which enables it to dock with the Target’s Docking Plate. Astroscale launched its corporate headquarters in Singapore in 2013, R&D office in Japan in 2015 and branch office in the United Kingdom in 2017, and has a representative in Washington DC. Astroscale has so far developed two demonstration satellites. Its first, the 25-kg IDEA OSG 1, aimed to monitor small orbital debris, but was unfortunately lost in the Soyuz launch failure in November last year. The ELSA-d is the second.